My artistic impulse is to let the beauty of the real world shine into the realm of mathematical patterns. My method combines photographs with complex-valued functions in the plane to create images with all possible types of symmetry: Euclidean, hyperbolic, and spherical symmetries (as these act on the plane). For some works, I then transfer plane images back to the sphere. All these methods are explained in detail in my book Creating Symmetry: The Artful Mathematics of Wallpaper Patterns, published in 2015 by Princeton University Press. Wallpaper patterns created from wave functions have natural ways to vibrate into the future. Recently I have explored these vibrating wallpaper patterns and connected them to musical sounds. Video by Frank A. Farris, music by William Susman. Commissioned by the San Jose Chamber Orchestra, Barbara Day Turner, founding conductor. Back in 1997, I visited the Geometry Center and was helped to create my first primitive movies of vibrating wallpaper. In 2011, I realized the dream of using photographs as color wheels for wallpaper images and this led to my book about wallpaper. Only in 2017 was I able to create my own movies of vibrating wallpaper. Barbara Day Turner, founding conductor of the San Jose Chamber Orchestra, saw my movies in 2017 and proposed a collaboration. 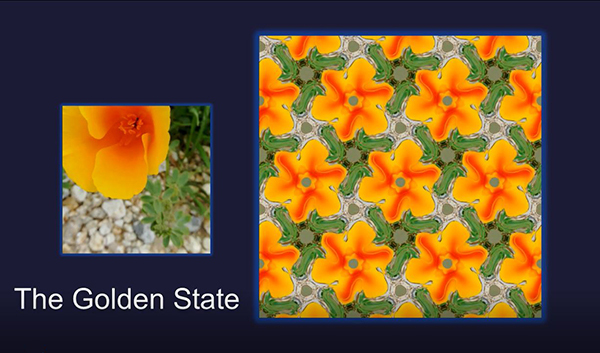 She commissioned composer William Susman to write "In a State of Patterns" to accompany my animations, which are based on five photographs of California scenes. Susman's post-minimalist minimalism is a perfect marriage to the mesmerizing images of wallpaper that changes dreamily as we watch.